Trae Young has a talent for camouflage. On an open stage in front of 20,000 people, Young can hide for solo celebrations after his best plays. The key is simple: Set up a teammate for something spectacular, and when the spotlight turns their way, your moment of elation remains private. In those hidden seconds, Young celebrates in a unique way. 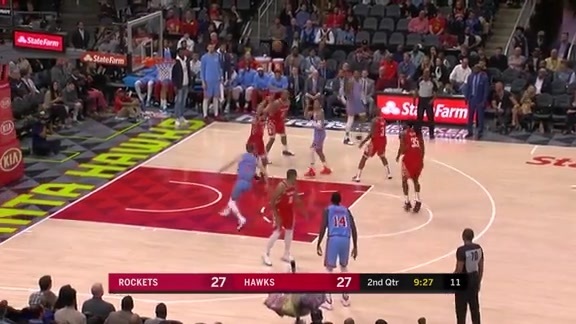 When he dishes a pass to a teammate for a Sportscenter-worthy alley oop, Trae takes a tiny, synchronized leap with them. Of course, every NBA team – the Hawks included – spends hours and hours reviewing video, scouring it for useful details in every corner of the court. As a result, Trae's teammates have seen his full array of jumps. Kevin Huerter: "Somebody brought it up in film room one time. 'Trae, what are you doing over there?' And he starts laughing." Dewayne Dedmon: "The skip? You noticed that too? It's crazy, bro. It's weird. I mean, it's not weird, he's just excited." John Collins: "From the first couple of times, throwing myself or whoever the lobs – it's usually those exciting plays where he gets excited too." Huerter: "We say that he gets just as excited for us dunking it as we do. I wonder if it must be like a nervous twitch." Kent Bazemore (smiling from ear-to-ear): "I saw that earlier in the year. I don't know. I still can't figure it out." Collins: "He knows. It's like he's made that pass so many times, that when he throws it, he knows the difficulty of the pass that he has thrown me and what I can do with my ability, so he is already jumping, 'Aw, this dunk is a done deal,' basically." Dedmon (denying that it might be body english on lob passes): "Remember when he did the reverse between-the-legs and dropped the dime? He still skipped. Any time he drops a dime like that, he'll do a little skip. That's what it is." None of these celebrations happen without Young's passes; this whole phenomenon begins and ends with them. Young finished second in the NBA in total assists (653); only Russell Westbrook has more. Young has every conceivable type of pass in his arsenal: lobs, bounce passes in traffic, full-court bounce passes, left-handed sidearm passes, nutmegs, passes out of double-teams, skip passes, etc. Name the pass, and Trae Young can throw it. The scary part is that Young has room to grow as a passer. His turnovers have dropped over the course of his first season while his assists have gone up. And the milestones are unprecedented. Young now has the most assists ever by a rookie 20-years-old or younger; in the month of March, Young passed Chris Paul, John Wall, Isiah Thomas and Magic Johnson to get to the top of that list. Over the course of his rookie season, Young has said numerous times that his favorite play on a basketball court is an assist. "I'll let y'all be the judge of that," Young said. "I think you see the excitement that I have whenever I'm making a pass to a teammate and they hit a big three or a dunk." At the same time, the joy that Young gets from his skills as a distributor extend far beyond getting a pass from Point A to Point B. Young is more parts Magic Johnson than he is John Stockton. He wants to make plays – passes and otherwise – that make fans stand up from their seats. There is an unbridled enthusiasm for the spectacular in his game. And as soon as a player nutmegs LeBron James twice in the same win, as Young has done, there is no longer any point in denying it. "I've done some crazy things as far as on the court," Young said, before describing a sleight-of-hand pump fake that he successfully used to hide a ball in a high school game. "I put the ball between my legs and acted like I was shooting a layup. I did that in a game. I've done some things in games that have never been done just because I just have so much fun and I just have that much confidence in myself." Young and Collins represented the Hawks at All-Star Weekend. Young took part in the Skills Challenge and Rising Stars Game while Collins participated in the weekend's flashiest and most memorable event, the Dunk Contest. Before the weekend, the pair agreed on one hypothetical question posed to them. (For what it's worth, the question was asked of each player separately like some sort of unintentional version of The Newlywed Game.) If Young could trade places with Collins and enter the Dunk Contest, would he? Collins and Young agreed. If – with the requisite emphasis on the conditional if here – Trae had the requisite height and hang time to compete in such an event, he would. As far as every other quality that is desired of Dunk Contest participants, Young has them all: the flash, the creativity, the magnetism. None of which is to say that Trae Young can't dunk; he most certainly can. Sometimes his veteran teammates, notably Vince Carter, prod him occasionally after practice to show them that he can dunk, which he will do. A number of dunks that Young has in his repertoire involve passing the ball to himself, and he thinks that he will eventually dunk in a game someday. "Oh yeah, I'm getting up there," he said with a chuckle about his future in-game dunk prospects. "People don't think I can dunk. I've got to show them that I've got a little bit of bounce." In the meantime, if Young wants fans to pop out of their seats to cheer a dunk, he will have to operate vicariously through his teammates, something he has done more than other NBA player this season. Young had a league-best 191 assists on dunks. As a team, the Hawks put together quite a dunk resumé: they finished the season third in the NBA in dunks per game (7.36). On the individual side of things, two Hawks ended 2018-19 in the top-20 in terms of total dunks. John Collins ranked 10th with 157 dunks despite missing the first 15 games of the season. Center Alex Len ended up 18th with 120 dunks, six of which came in his most recent game when he scored a career-high 33 points in an epic performance in Milwaukee. 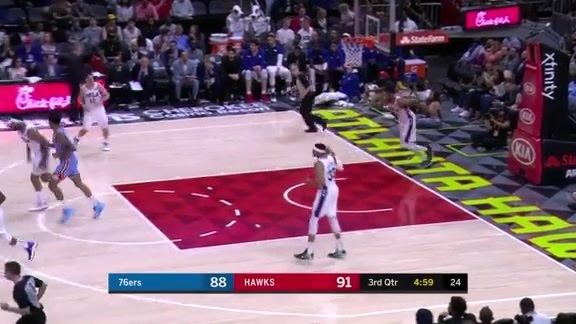 Bazemore likened the young Hawks to another team that made an imprint on the league with its' high-flying show: The Los Angeles Clippers of the early 2010s. 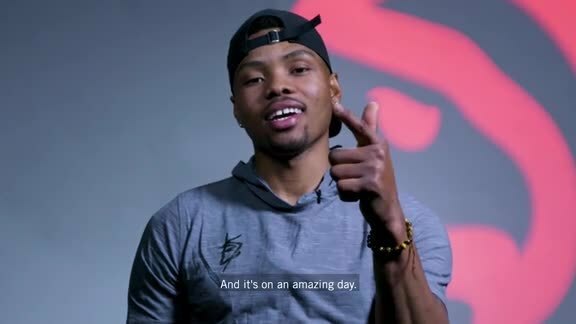 "The ceiling is super high for them, kind of like back in the Lob City days with Chris Paul and DeAndre (Jordan) and Blake (Griffin)," Bazemore said. "It's fun to see John play above the rim like that." To be clear, Bazemore was talking about a metaphorical ceiling. Back in July and August, Alex Len weighed the prospect of getting set up for lobs and other easy scores when he had to pick his team in free agency. At that point, he had already gotten a glimpse of Young setting up teammates in Summer League. The idea hooked Len, who had visions of the one time that he had played with a special facilitator. "I had never had a point guard like that," Len said of watching Young. "The only time I had played with somebody like Trae, it was Steve Nash and it was a pickup game." At the time of that pickup game, Nash was living in his offseason home in Phoenix while trying to get prepped and healthy for a season with the Los Angeles Lakers. Len was working to gain a foothold in the NBA as a young member of the Phoenix Suns. Len seized the opportunity to play with a generational passer. "I remember playing in that pickup game, and everybody was like, 'Damn. You looked great today.' "
With one game remaining in the 2018-19 season, Len has already scored a career-high point total despite mostly playing off the bench. While part of that is Len's addition of a three-point shot, the playmaking around him has helped. A career-high 72.0 percent of his two-point field goals have been assisted by teammates. Trae Young, elite table-setter, has been a big part of those setups. Young has assisted on 78 of Len's scores this season. No other Hawk has more than 29 assists to Len. Incredibly, Young has become Len's favorite quarterback despite only been on the floor for 858 of the 1544 minutes that Len has played this season. Len has indeed found the creator that he craved, his Steve Nash. "Trae reminds me a lot of him," Len said. Trae Young has not always been a point guard. "When I was growing up as a kid, I actually was a shooting guard on my team," Young said. "I couldn't dribble. I didn't like dribbling the ball. I didn't like the pressure." But he practiced feverishly and his handle grew over his grade-school years as did his passing ability. When the obscure passes from his practice sessions became the improbable in-game assists on highlight scores, Trae started jumping. "I've always done that," Young said, tracing back the history of his celebratory skips. "Every level I've been at, I've always done that." Despite knowing the what and the when, Young didn't have a concrete answer when it came to the why of his post-pass leaps. "I don't know what it is," Young said. "It's just like a string attached to both of us. When he goes up, I go up." Then he broke into a broad grin. "They go up a little bit higher. It's just a string, I guess."